Back in early July of 2013, I was the fortunate winner of a drawing for an Android Watch Repair Kit from the now defunct MyWristwatch Forums. It was a cool prize to win because I've long had a stash of cool watches that were just to big for me. So, I've started removing links from all of those watches that just didn't fit. Now, I can wear them and properly introduce them. You can get a similar watch repair kit here on Amazon. 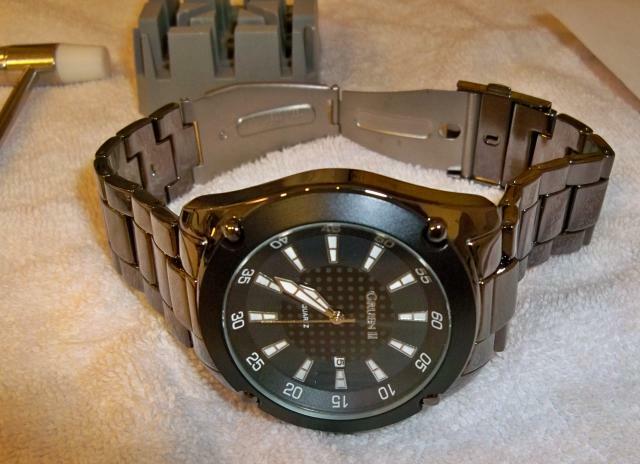 Here is one of the first watches that I resized. It's a Gruen II that I bought at Sears two years ago. When I pulled them out of my secret stash, I was surprised to find that it was still running. I liked this watch because it has a clear and readable dial and has a background that looks like high tech carbon fiber. At somewhere around $30, the price was attractive, too. There are some other watches made under the Gruen name today. While the legendary Gruen watch company is gone, the name lives on. 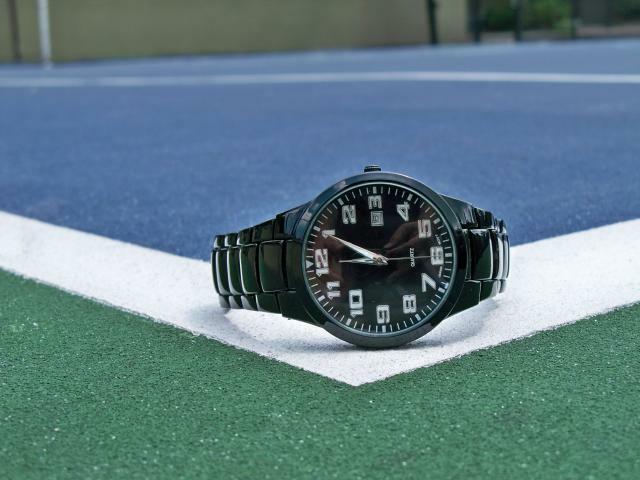 You'll find the Precision by Gruen watches on some basic watches at Kohl's. 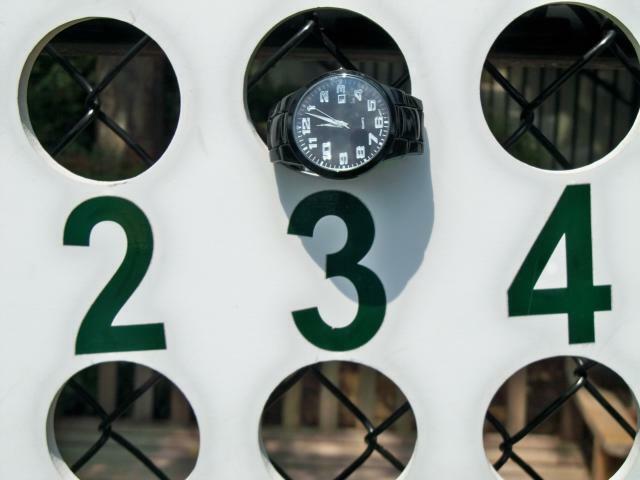 You know you are a watch nerd when you think the tennis court is a great place to shoot some watch pictures. This basic black Walmart watch doesn't get enough respect. But, sometimes it's nice to go to the back of the watch box and pull something out that is just a little different. This watch is all business in basic black. But, there is nothing wrong with a basic watch with a readable dial. It has a shiny polished (enamel?) black band and case. It cost less than $15. 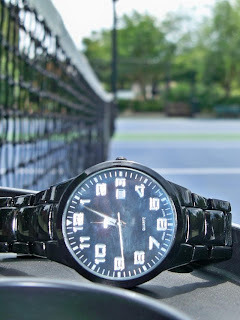 Of course, if you play tennis on a more high falutin' court, you may want to get your basic black wristwatch from Gucci! 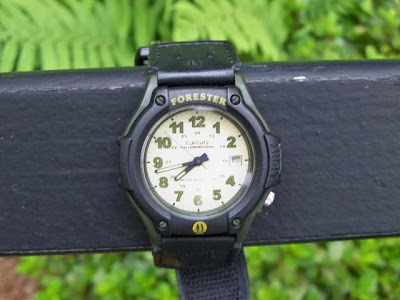 The Casio Forester is one of my favorite watches. It's the perfect watch for banging around in. It's inexpensive, tough, and lightweight. It also has a long battery life. 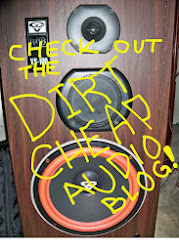 I first reviewed mine back in August 2011 and it is still running strong two years later. If you aren't hung up on prestige and appearances, you might like this watch. The Forester would be a great companion on a hike. Perhaps you could hit the Appalachian Trail or the Pacific Crest trail? You could do something glamorous like an archaeological expedition. But, you could also leave that sort of thing to the super macho commando watches that cost 100 times more. The Forester is a great watch for mowing the lawn, helping a friend move, or walking the dog. With 100 meters of water resistance, the Forester is built for adventure. But, if you are an armchair commando, you'll find the velcro band super comfortable for long stints of typing at a desk. 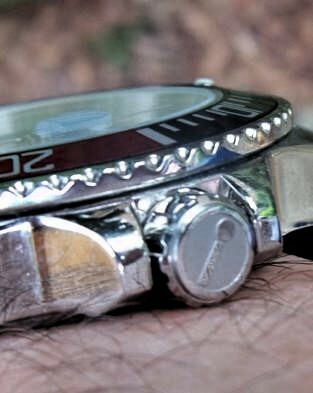 I like to take pictures of my watches in unusual settings. 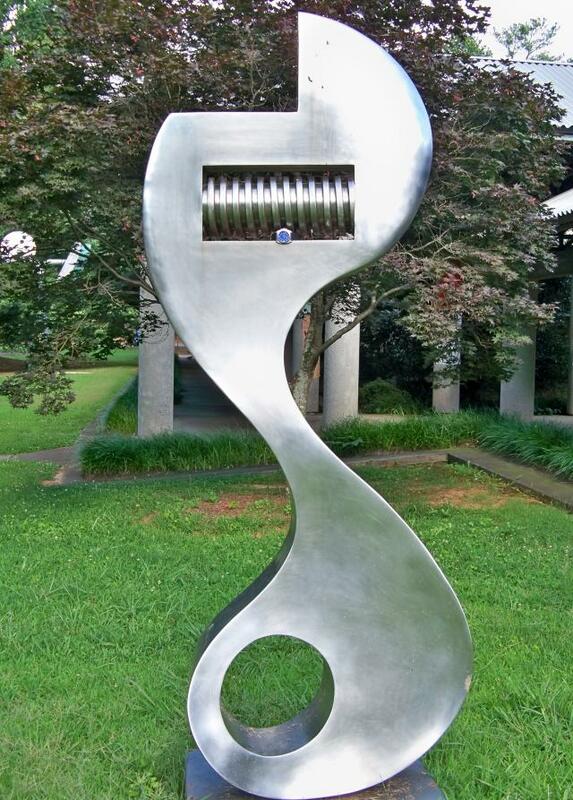 "Spookie Tooth" by Andrew Crawford is a statue of a giant adjustable wrench located in Sandy Springs, Georgia. It makes a perfect backdrop for my Marc Ecko Rhino watch. If you'd like to take a closer look at some other Ecko designs, here are a few more of the Marc Ecko watches now being sold at Kohl's! Do you have any skeletons in your closet? How about in your watch box? 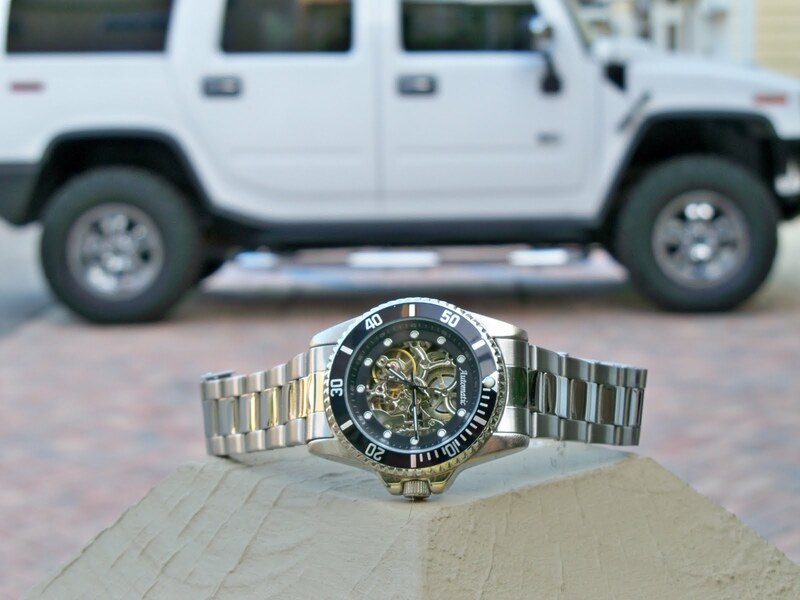 Skeletonized watches that offer a peek into the workings of a mechanical movement are very popular. One of my favorites is the simple automatic (above) from Walmart. It has the lines of a diver, but allows you to see the inner workings of the watch. It was originally introduced for an amazingly low $50. It didn't stay in the stores long. However, now, many watch companies are bringing skeleton watches to the marketplace at affordable prices. For example, the Relic skeleton below is only $82.50. If you think it is a little more hip to be square, this Relic brings the skeleton design into a rectangular box. My watch collection recently grew with the addition of a brand new Insignum Subwave Dive Watch from my friends at ZuluTimeZone.com. They are now carrying the full line of watches from this German brand that combines German design and quality control with global sourcing and affordability. I'm really excited about this Insignum watch because it is a real dive watch rated for 200-meters of water resistance. 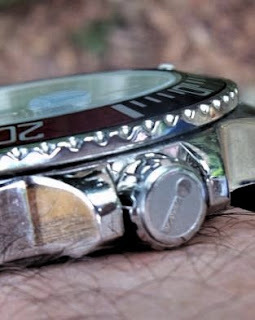 With this rugged watch, I'm all set for serious underwater adventures. 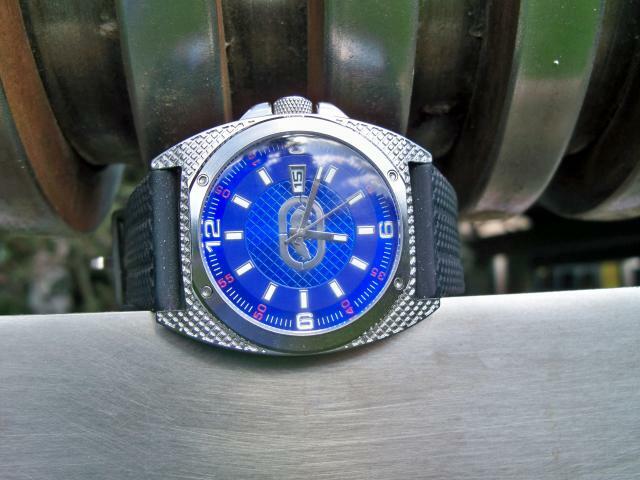 It's made with 316L stainless steel for the case and the bracelet. It also has a sapphire-coated glass crystal. It has a unidirectional rotating bezel for timing your dive (or my pizza). Most importantly for water resistance, it has the screw down crown to keep water out of the Japanese quartz movement. Once you've got a watch like this one, you'll have to gear up!